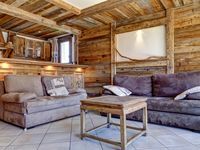 Luxury Flat In Courchevel 50m from ski and 500m from the center. Property 66: Luxury Flat In Courchevel 50m from ski and 500m from the center. 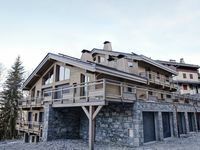 Property 72: Ski Apartment In Trois Vallees. First when we seen the price we thought that it was a bug. But it was not. This chalet is really good value for money. We really enjoyed our holidays in la Tania there. It is brand new, well equipped. We will definitely come back next year. We really liked the apartment, it was as it looked in the pictures, comfortable and warm, with a great bathroom! I thought the double was a bit small if there were 2 people, which there werent, and the kitchen lacks any knives for cooking.. not knives and forks though. The flat was hard to find on arrival and the underground carpark is like something from a nightmare. there is loads of storage in the flat and cleaning kit and the location is really convenient being quiet yet close to the centre. all the decoration is really nice and the flat is very fitting with the surroundings, with lots of antique wood. we had a great holiday, thank you.